Generally the content we share is considered polished and a final cut. The stories filmed and produced by our team reflect the experience or ownership of a specific build or vehicle that we've found interesting. This will continue to be the model we use when producing content but, after some recent soul searching, we thought it might also be fun to share in some of the adventures we experience when filming. 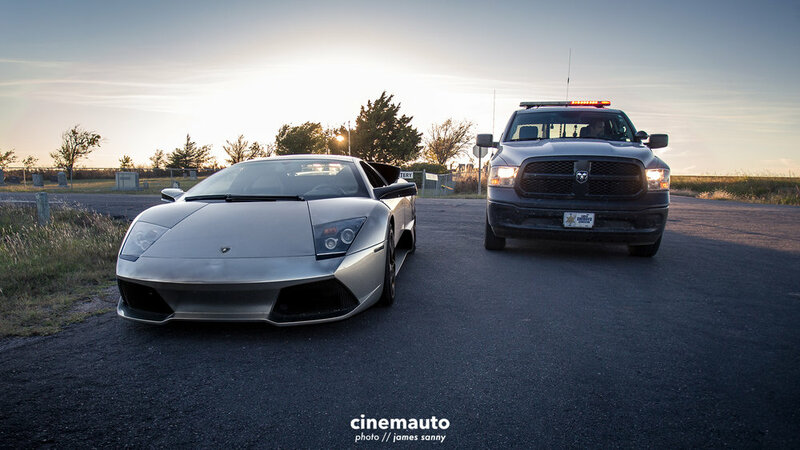 What better place to start than with one of our most recent expeditions, filming a 2008 Lamborghini Murcielago. 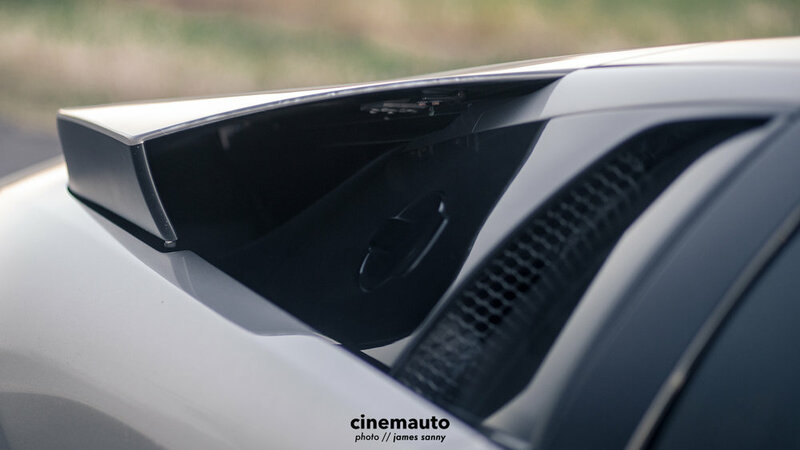 Our friend Patrick is no stranger to Cinemauto or the work we do. Early on we had the opportunity to take some pictures of his orange GTR. So, when we caught wind of his newest acquisition it was pretty clear something needed to happen. After a few messages back and forth, a plan for filming was established and we began prepping the gear. 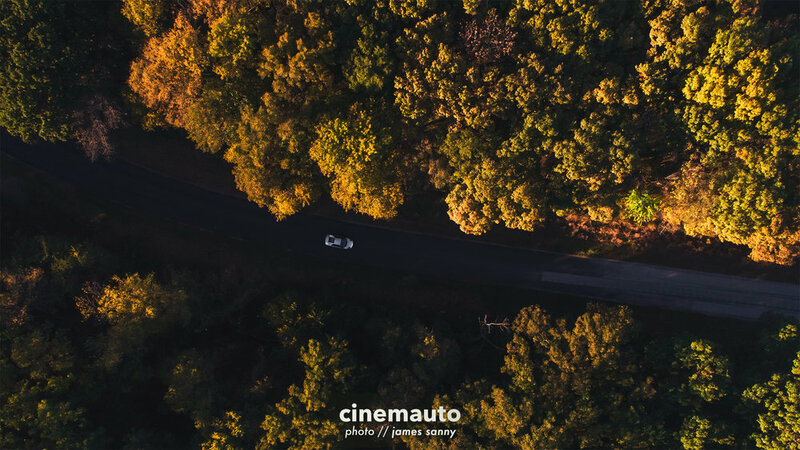 It's important to remember how valuable a decent location can be when working with a vehicle. Finding locations that work for filming can be more difficult due to the constant motion involved. For this reason we took a short drive out of town to a fun little stretch of road that would look nice on film and provide something more exciting than a standard Kansas straightaway. To say the experience was "more exciting" would be a bit of an understatement. Like most folks who are in a hurry to get around in Kansas, we made use of the turnpike (or tollway, depending on where you're from) to get to our destination. It was this part of the trip that would foreshadow the remaining events of the evening. Did you know that using the K-Tag lane improperly could result in a $500 fine and possible jail time? Of course, that's only if you get caught. This was mistake number one. Exiting the turnpike, we made our way east to the road we'd earlier scouted via Google Maps. Following the turn-by-turn directions given by GPS, mistake number two, we ended up at a small church surrounded by gravel roads. Remembering we're out here to film a Lamborghini, this wasn't the route we were looking for. A quick reroute on Maps took us back up to a small town we'd ventured through prior. Yep, this is mistake number three. As we entered back into the small town, I received a phone call from Patrick saying we needed to top off the Murci. Did you know that Casey's General Store, while well known for its pizza, is not famous for premium? What small towns lack in variety of fuel they make up for in variety of law enforcement vehicles. While discussing fueling options for the next town over, we were quickly swept into a scene you usually only find in the movies. A Ram truck, complete with flashing light bars, boxed the Murci into its parking stall. Moments later, the Ram truck was joined by another officer in a Dodge Charger. At this point, time seemed to stand still. Both officers, tucked safely away in their vehicles, weren't budging.. leaving us each wondering, "What's going on?" After waiting for what seemed like an eternity, the officers exited their vehicles and began to question Patrick. "Did you just get off the turnpike? What were you doing for the last 30 minutes? Is this your vehicle? When I run the plate, why does it say it's registered to a Maxima? Do you realize you skipped the toll? Did you know we can arrest you for that? If you don't mind me asking, how much is one of these?" Making a quick run back to the turnpike to set things straight, we were then back on the road and heading out to find some premium. Though it took pulling through another Casey's, our third try yielded premium and a second wind. Sure, we were well behind schedule to begin filming but, all things considered, we'd lucked out on the outcomes. At this point, there was little reason to call it off and head back, so we pressed on. A few miles south of town we found the road we'd been hunting. It was a nice stretch of road that offered a few decent curves, some trees, a little elevation for scenery, and virtually no other traffic. As far as Kansas is concerned, this might just be the Mecca of driving roads - and with little to no wind, low 70's, and plenty of evening light left, we'd thought we hit the jackpot. Two hours and several passes down the road later, things started to wrap up. Patrick had a blast cruising this nice stretch of road, we gathered a variety of angles and shots to piece something together, and we'd even spotted a new Z51 Stingray out enjoying the very same activities. As the late afternoon began to transition into early evening, we knew it was time to grab the last bit of video necessary to wrap the project. The decision to stay and film a little longer would end up being our fourth mistake. Enjoying one last cruise down the newfound road, an odd and repetitive noise inside the SUV began to overtake the exhaust note of the straight-piped V12 in tow. The easiest way to describe the sound- "knock-knock-knock-knock.." We shouldered the vehicle as quickly as possible and stepped outside to have a closer listen. "KNOCK-KNOCK-KNOCK-KNOCK.." And so we killed the ignition and the bent rod killed the SUV. Reaching out to AAA for a little roadside assistance proved to be a great way to avoid dealing with our next encounter with the law. While answering a variety of questions about where the vehicle was broken down, as well as whether or not it was safely off of the road, Patrick was left to sweet talk the new officer into understanding what we were doing and why it was completely legal. Apparently residents along the road we'd been using had been calling the police all afternoon with reports of dangerous street racing taking place between an SUV and a sports car. 15 minutes of Q&A and both AAA and the Sheriff were more than satisfied. With all of us working a relatively traditional schedule, I decided it wasn't necessary for everyone to stay and wait on a tow. Loading up into the Murci, my partners in crime headed back to Wichita in an attempt to avoid local wildlife and tuck the exotic Italian away for the night. I stayed behind to protect my kill and thank every single passerby who offered to stop and help. Say what you will about chivalry but these small town Kansas folk don't know any strangers. As the last shades of red and gold disappeared below the horizon, a tow truck arrived with an SUV sized gurney on the back to whisk me away back to civilization. Exiting the truck he looked me straight in the eye and said, "So.. what were you trying to keep up with?" I scoffed, motioning at the dead SUV and said, "No.. In that? C'mon.."
He said, "No really. What was it?" With a bit of hesitation in my voice I responded, "..a Lamborghini." As he finished fastening the SUV to the flatbed he laughed and said, "Oh, I know.. I've been listening to the scanner in my truck all afternoon. They've been hunting you guys for hours."